The soil is waking up. Weeds that managed to sprout in fall and winter are starting to grow, the sure sign that it’s time to start planting cool-season crops. There are plenty to choose from because most greens, peas, potatoes and the entire cabbage clan are cool-season vegetables. Note that tomatoes are not on the planting list quite yet. Their time will come. While winter is far from finished but summer is still months away, take the opportunity to stock your garden with cool season crops. Come the merry month of May, you can be eating a garden salad and transplanting tomatoes in the same day. Cool-season vegetables can grow at cool soil temperatures, which I will define as 50 to 70°F (10-21°C) in the root zone, which is measured 4 to 6 inches (10-15cm) below the soil’s surface. In comparison, warm season vegetables such as tomatoes and peppers prefer root zone temperatures above 70°F (21°C). But even very cold-hardy vegetables do not grow much until soil temperatures rise above about 50°F (10°C). Low temperatures restrict the release of soil borne nutrients, and research has shown that root-friendly fungi also become more active as temperatures in the root zone rise above 59°F (15°C). It’s easy enough to take your soil’s temperature. Soil thermometers are inexpensive, or you can use a probe-type meat thermometer to get a general idea of the root zone temperature in different parts of your garden. The numbers need not be exact, because this time of year they are relative. Yesterday when I measured the root zone temperature in various parts of my garden, I found a 10-degree difference between the root zone temperature in the warmest spot, inside a glass-topped cold frame, and the coldest one – an open bed sporting a light fuzz of winter weeds. Your hands and fingers make good soil thermometers, too. When you’re pulling out chickweed and you can feel the cold through your gloves, the soil temperature is probably below 50°F (10°C). Soil that has reached 59°F (15°C) no longer feels as cold, and it is also the perfect soil temperature for planting cool-season vegetables. Especially in spring, it is essential to harden off indoor-grown seedlings before setting them out in the garden. Leaves that develop under fluorescent lights, or in daylight filtered by glass, have thin tissues that are lightly stocked with chloroplasts – the sturdy, hard-working organelles that turn light into energy. A period of five days or so of hardening off, in which the plants are gradually exposed to more direct sunlight and moving air, stimulates the vigour of the chloroplasts and the leaf and stem tissues that protect and support them. I also like for my cool-season vegetable seedlings to spend a couple of chilly nights outdoors before they are transplanted, which prepares them for the differences in day/night temperatures they will face in the garden. Cold frames, cloches and tunnels covered with horticultural fleece help to warm the soil and protect plants from cold and wind. I like to start out the season under glass, because I have found that the soil in glass-topped frames or beds warms up quickly, and glass is hard to beat for protecting plants from late winter ice and snow, or even hail. Low-growing rocket, lettuce, spinach, and escaroles are excellent cool-season crops to grow under movable glass-topped frames. Two disadvantages of glass are that the soil inside the frames dries out quickly, and good ventilation must be maintained at all times. Cabbage family crops are too big for many low frames by the time they are big enough to set out. 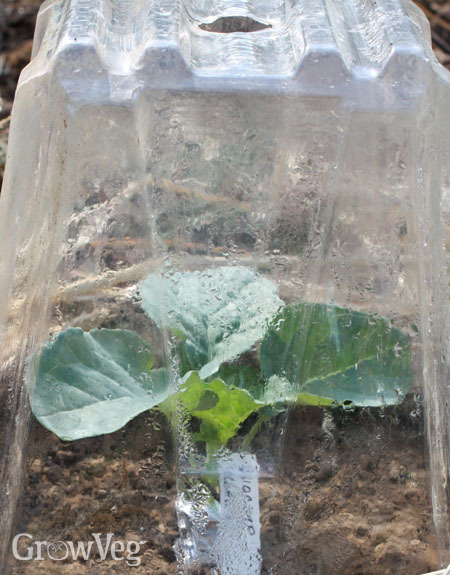 Plastic ventilated cloches (including those made from milk jugs), row cover tunnels or both greatly benefit cabbage, kale, collards, broccoli and kohlrabi seedlings during their first weeks in the garden. Plastic cloches alone do a great job of protecting plants from cold and wind, but consider adding horticultural fleece snugged down over the cloches, in the event of a sudden cold snap. The fleece will give the plants more insulation while holding the cloches in place despite blustery winds. You can get a dozen cool-season vegetables growing vigorously several weeks before your last frost date, but I must caution beginners against pushing up planting dates for frost-tender tomatoes, peppers, beans and basil. The best way to increase your luck with these and other warm-season crops is to be patient, and wait until frost is but a memory to plant them out.